Even ESPN’s Andrea Adelson went as far as staying “This, my friends, is the best coaching fit among all the hires that have been made so far in college football.” in her article “Willie Taggart the Perfect Fit for USF”. 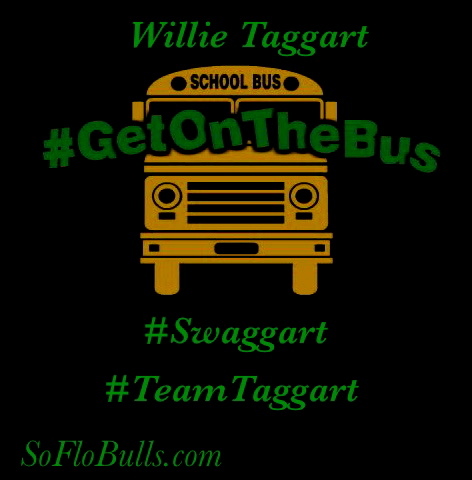 And we all know Adelson NEVER has anything positive to say about USF… Knicknames so far: #TeamTaggart, #Swaggart, #Swaggy, & #GetOnTheBus. –Records: 2012: 7-5, 4-4 Sun Belt; 2011: 7-5, 7-1 Sun Belt; 2010: 2-10, 2-6 Sun Belt. Thoughts: I’m high on Taggart because of his Florida Roots (Bradenton Manatee HS) & his heavy presence in FL, specifically Tampa Bay area Recruiting Scene. Taggart was a QB for Bradenton Manatee HS & won a state championship in 1992. Taggart was recruited by Jim Harbaugh for his father’s, Jack Harbaugh, WKU squad for college, which led to him becoming an assistant coach under HC Jack Harbaugh’s Hilltoppers’. Taggert was the OC for the Hilltoppers’ 2002 D1-AA National Championship. Next, Taggert spent 2007-2009 as Stanford’s RB coach under HC Jim Harbaugh, where he developed Doak Walker Award winner Toby Gerhart (Minnesota Vikings). In 2010 Taggart became the WKU HC, bolstering a roster full of Floridians. With Taggart’s Harbaugh blood line & extensive Florida connections, I expect him to have a major impact as the new coach of the South Florida Bulls. Prepare for a re-birth!